Chickens need balanced diets to perform well. Minerals and vitamins allow the animal to perform necessary body functions, lay strong eggs and fight off infection. Fats and carbohydrates supply the body with energy, while proteins give it a steady supply of necessary amino acids. If you want to add some more protein to your chickens’ diet, mealworms are an easy, low-cost way to go. Chickens need protein, especially when they are growing or laying. 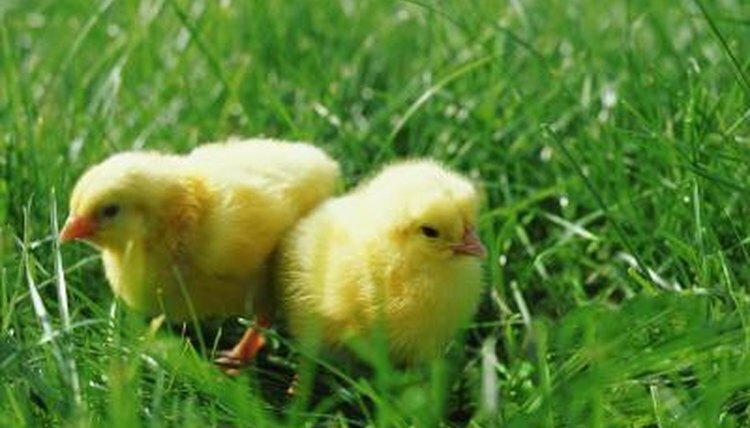 New chicks do best with a protein diet of 20 to 22 percent, while pullets need a rough percentage between 14 and 16 and laying hens somewhere between 15 and 18 percent. For hens in the home garden, an all-purpose grain should contain around 16 percent protein. Since mealworms are roughly 50 percent protein, they are an excellent addition to a chicken’s diet, and also supply fat, carbohydrates and calories. Because so many good commercial feeds are available for chickens, owners usually don’t need to spend much time calculating the necessary nutrient percentages for them. In fact, giving chickens too much of one nutrient or another on top of a balanced feed can actually throw their diet out of balance and be harmful. However, small treats to up a chicken’s protein intake, especially when she is young or during laying season, isn’t a problem. Since chickens who are allowed to range naturally scratch for bugs and worms, supplementing with mealworms is in line with their natural instincts. The mealworm is the larval form of the darkling beetle. Mealworms eat and grow in size during their larval stage, and pupate anywhere between 12 to 18 weeks. The pupal stage lasts for a week or two, after which they turn into dark brown or black beetles. A mealworm colony should at any given time have both larvae and mature adults who are laying eggs living in it. You can harvest mealworms at any time to give to chickens, so long as you leave enough to turn into adults and lay more eggs. Unfortunately mealworms can also cause severe infection of chicken houses or other environments where chickens live. They destroy insulation, and the adults can also transmit both tapeworms and the virus causing Marek's disease of poultry. For this reason, it is important not to simply throw mealworms into the chicken yard or house. Instead, keep them away from the house and only feed your chickens as many as they can eat at one time.